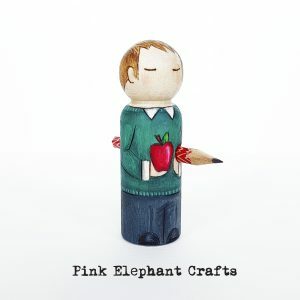 The perfect Thank You gift for that very special teacher; a pencil holder using our original Drilled Doll design. 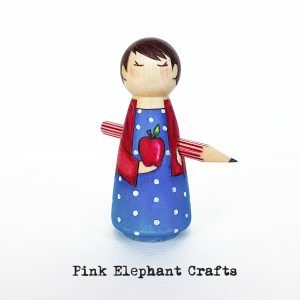 Brightly coloured, holding an apple and a small pencil that I have decorated myself to compliment the design of each doll, our Teacher Gifts will sit proudly on Miss or Sir’s desk for sure! The small pencil ensures that there’s always something on hand to write that important note or for a quick spot of marking! Each one has gone through our extensive creative process. They are hand drawn, wood-burned, then coloured with a mixture of the highest quality of watercolour and pencil. This technique enhances the gentle grain of the beech wood that the peg dolls are turned from. As with all our peg dolls, your teacher gift will arrive to you beautifully packaged and ready to give . A care card is included to ensure this hand crafted creation stands the test of time. Or at the very least, the test of 30 eight year olds after a rainy play time! 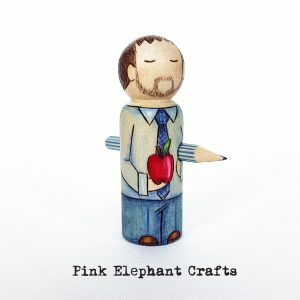 The Teacher Gift peg dolls can be personalised with a short greeting or name. Please see the illustrative example within each product listing to give you an idea of the space available.